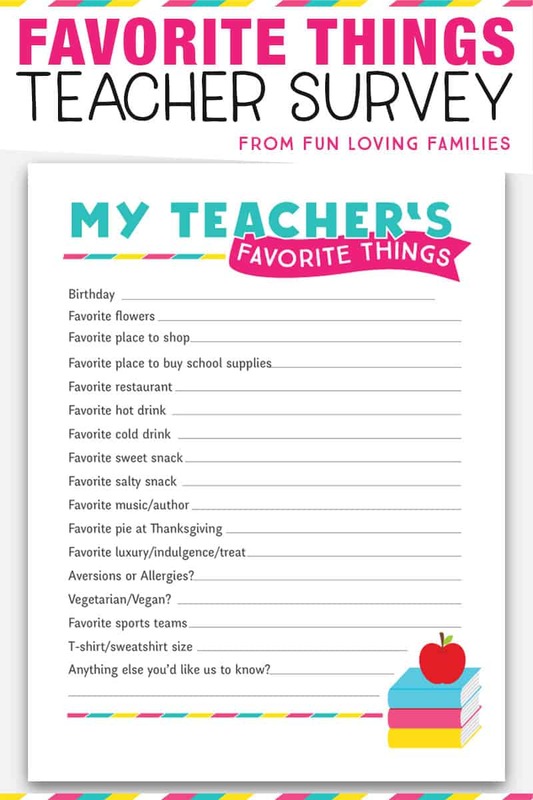 Send this Teacher Favorite Things printable questionnaire with the kids on the first day of school to find out all of the things your new teacher loves. It’s a simple to fill out survey that you can then use for thoughtful teacher gifts throughout the year, including Christmas gifts, and Teacher Appreciation gifts! We love our teachers, and are always looking for ways to show how much we appreciate their dedication to our kids. We usually get a “favorite things” survey around Teacher Appreciation Week, but since that isn’t until May, that leaves us with most of the school year just guessing at what the teacher’s might like. What about the rest of the year?! What if we want to surprise them with coffee or doughnuts. Or maybe bring flowers for a birthday? Of course, we can just make a guess, and we know the teachers would appreciate the thought no matter what. But, if we just have a little bit of information ahead of time, we can feel good knowing we’re truly doing something special for our wonderful teachers. This year, I decided to create this simple questionnaire to give to the teachers on the first day of school or “Meet the teacher” night. Now, we’ll have a whole list of their favorite things to refer to throughout the year, anytime we want to do something to brighten our teachers’ days. And, we can look back at the favorites list for bigger occasions like Christmas gifts, and Teacher Appreciation Week. Of course I’m sharing the printable with you so you can compile a teacher favorites list of your own! 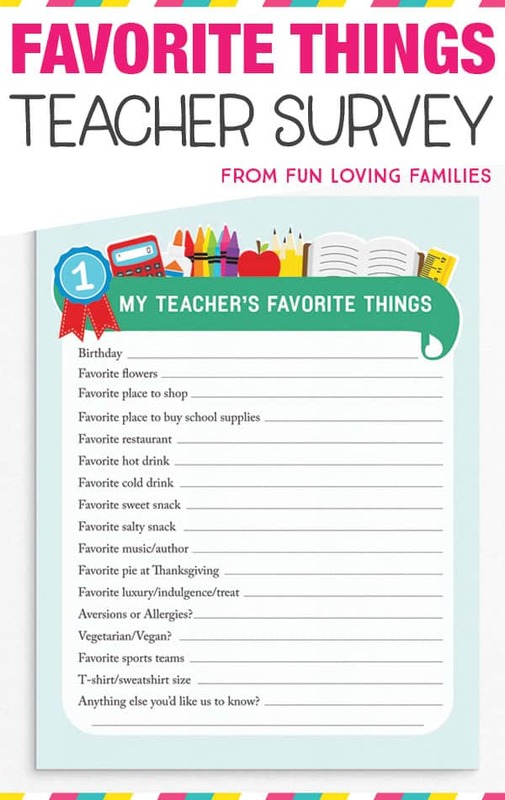 Whether you’re a parent or a Room Mom looking for simple Teacher Favorite Things printable to use for your classroom, just click the button below for instant access to this free printable “Teacher Favorite Things” questionnaire. Pin the image below to share and save for later!